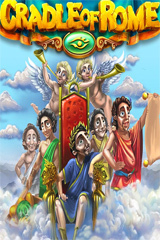 Cradle of Rome Free Game Download! Cradle of Rome is a brilliant mixture of match-3 and resource managment gaming mechanics. My hats off to the publisher. Build the heart of the Ancient Roman Empire and become the Emperor! This legendary city was one of the most beautiful and powerful capitals to ever exist in history. And you\'ll be able to bring back to life all the masterpieces of the Roman architecture. Use your matching skills to Coliseum can become a good training school for your brave gladiators! And the Pantheon - the Temple of all the Roman Gods - will bring you luck! The fabulous Caesar\'s land opens its gates in front of you in this engaging puzzle game Cradle of Rome! Pros: Very challenging, keeps you occupied and is highly addictive. Comments: This is a complicated match 3 game that you slowly build a village of Rome. Each level, you become a merchant, priest, and so on.......It gets harder and harder as you progress.